After our children grew up and left the house, we began downsizing in preparation to move to a much smaller house in the country. We emptied all the upstairs bedrooms of our four bedroom, 2800 square foot house. We used only one of the bathrooms. Since I had already stopped teaching music lessons, our living room was no longer in use. We ate in the kitchen, not the dining room. I condensed my office full of file cabinets and teaching materials into my computer and a table full of books. These fit easily into the master bedroom. My husband used a small cubicle-style desk for his computer. As usual, around us on every available wall space, were shelves of books. When he measured how much space we were living in, it came to 650 square feet, including master bedroom, kitchen and bathroom. When we sold our house, we were much more prepared to move out. The amount of space available showed me that there was plenty of room for more people to live there. After all, five of our seven children had lived there with us. Why not rethink the space for co-housing? Another example comes to mind. When our second daughter was in elementary school, one of her friends lived in a house with three families. These included two grandparents, an uncle, aunt and their child, my daughter’s friend, her brother and their single mother. It was a large two-story with a pool in an affluent neighborhood. A third example comes to mind. I met a woman who needed to care for her aging mother. She converted a three bedroom house according to city code into a three-person nursing home. Later, she converted a larger house to accommodate six residents in a family setting. My husband’s aunt and her husband along with an uncle and his wife shared a two-bedroom apartment after World War II. They still remember their shared grocery list. A professional friend lives with four other singles in a six bedroom home in NYC. The sixth bedroom is their common area. A married couple rent two rooms from a man with a three-bedroom home in a suburban setting. 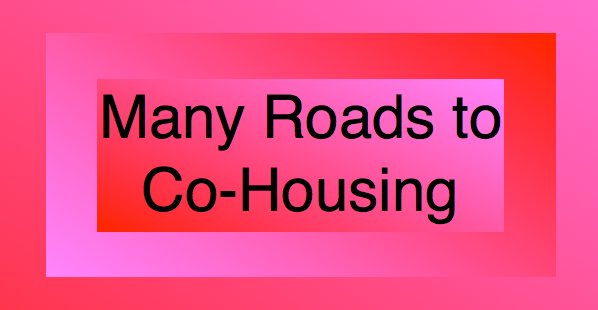 When I think about the abundant resources provided by the possibilities offered by co-housing, I am amazed. Child care, cooking, yard and garden. All these responsibilities are eased with different aspects of co-housing, utilizing the talents and desires most effectively of the folks who live there. It is important to be clear about the guidelines and to have a calm way of resolving any discomforts. Move from strained resources into shared abundance. Find out who is best suited for the different roles now provided. Work out the difficulties and the newness. Give more. Share more. Add to the harmony in the neighborhood. Let it spread.